The costs associated with obtaining a K-9 for a police department often prevent local agencies from getting a dog. But that was before 4 Heroes was created. The charity is the brainchild of Les Whinna, a retired Camden K-9 officer who’s the president of the Rolling Badges Law Enforcement Motorcycle Club, and Washington Township reconstructive surgeon Dr. Frederick LeVan, who is an honorary member of Rolling Badges. Members of Rolling Badges were looking for ways to give back to the community, said Whinna’s daughter, Daneen, who is president of 4 Heroes. “My dad has such a love for K-9s and for dogs in general, we wanted to help,” Daneen said. The charity is aimed at four hero groups: police, fire, military and first responders. The 4 Heroes group was created last summer. The first mission for 2015 was to give back K-9s, said Daneen. The group arranged for Glassboro police to replace K-9 Anka, who was killed after being spooked by fireworks last July. Ptl. 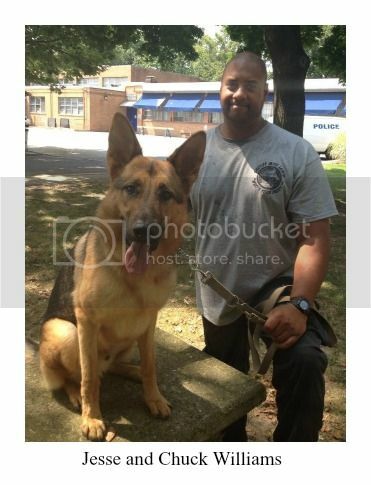 Chuck Williams is in the Philadelphia Police K-9 Academy with Jesse, a dog donated by 4 Heroes. The organization also donated other items for the dog, including a bullet-resistant vest. Williams and Jesse are currently undergoing scent/narcotics training and will graduate March 19. 4 Heroes also provided financial support to help the Northern Cambria borough police department get a K-9, said Daneen. Next up is West Deptford, which will be getting a new dog courtesy of 4 Heroes. Cpl. Mike Franks, who just last week had to have his partner, Judge, euthanized for medical reasons, is also a member of Rolling Badges, said Daneen. And Pemberton just made a K-9 request. Donating a dog is “a major endeavor,” with dogs costing approximately $7,500, Daneen said. Money for 4 Heroes comes from private and corporate contributions; Cornell and Co. Inc. donated $2,500 and the Gloucester County Police K-9 Association donated $1,000, said Daneen. Les Whinna retired in 1983 after breaking his neck in the line of duty, his daughter said. After five surgeries, the damage remains a problem, she said. Daneen, 31, a nursing student, got involved and said she and her dad wanted to “make a father-daughter team,” which resulted in her being president of 4Heroes. You can help in another way, too, by donating via 4Heroes’ GoFundMe page.